Millions of children around the world are not getting the best start in life. They are missing out on the crucial care, stimulation and sensory education they need in the first five years of their life to fulfil their potential. A child’s brain is 90% developed by the time they reach the age of five. Children who start school without early years support can have a limited vocabulary and ability to learn, impacting their opportunities in later life. And even though the importance of providing nurturing care, including healthcare, nutrition, play, learning and protection, has been thoroughly proved, investment in the zero to five age group is still far too small. 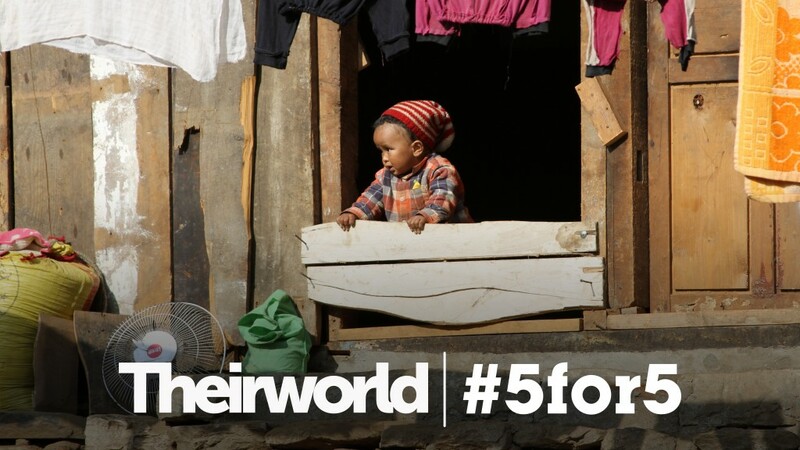 That's why Theirworld has launched the #5for5 campaign to put pressure on world leaders to take urgent action to make sure all children - especially the poorest and most marginalised - have access to the full range of nurturing care. The Sustainable Development Goals - a set of global targets agreed at the United Nations to be achieved by 2030 - includes ensuring all children “have access to quality early childhood development, care, and pre-primary education”. Now world leaders need to commit to a dramatic increase in funding and take action to support early childhood development programmes. The #5for5 campaign will highlight five key factors which are needed in the first five years of life to provide nurturing care - nutrition, health, learning, play and protection. Theirworld President Sarah Brown said: “Whether or not children have access to the best start possible in life is determined by two important factors - sheer chance and political will and resources. Theirworld held a #5for5 event in Los Angeles yesterday to give supporters and celebrities a sneak peak at the campaign and its goals. Among those attending the event were the British actor, writer and presenter Stephen Fry, British actress Bonnie Wright, former boxing champion Audley Harrison, American authors Holiday Reinhorn and Katherine Schwarzenegger, and the Filipino writer and campaigner Evelin Weber. The launch of the campaign coincides with the publication of a new influential report by medical journal The Lancet. The report shows that the cost of inaction is huge. It says that "children who do not meet their development potential may forfeit up to a quarter of adult earnings, and some low and middle-income countries as much as twice their national expenditure for health". Early childhood development supports children’s nurturing care and development from birth to five. It includes programmes and services that every child needs to thrive and get the best start in life. What does a child need to get the best start in life? Researchers have proven that investing in the early years is one of the smartest investments a country can make to break the cycle of poverty, address inequality and boost productivity later in life.